Aunt Bee's easy Southern Sweet Potato Casserole with Pecans just might steal the show at this year's holiday feast! 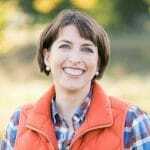 My great Aunt Bee’s easy Southern Sweet Potato Casserole with Pecans just might steal the show at this year’s holiday feast! Quite simply, the only sweet potato recipe that you will ever need — and it only requires about 15 minutes of prep! 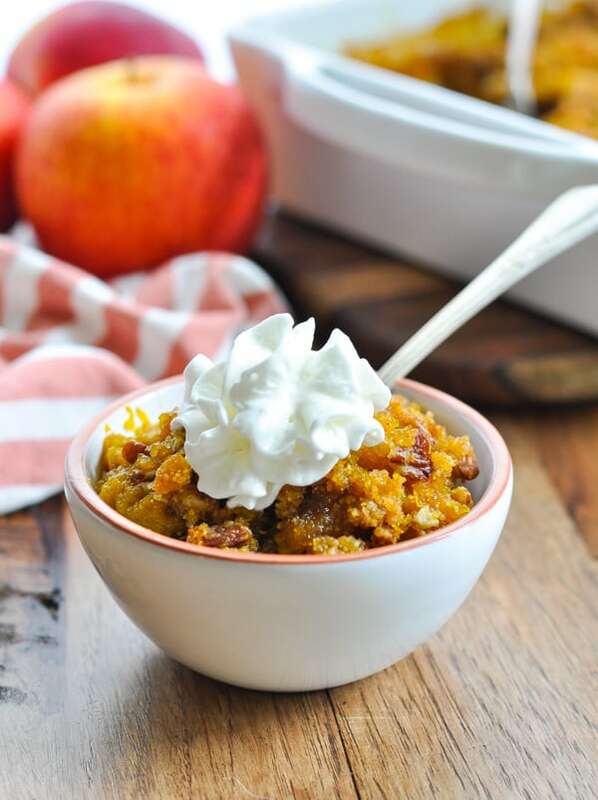 While I’ve tested a lot of sweet potato casserole recipes over the years, my great Aunt Bee’s decadent Southern version blows them all out of the water. It is THAT good. Absolutely, 100%, my favorite way to enjoy the favorite fall side! 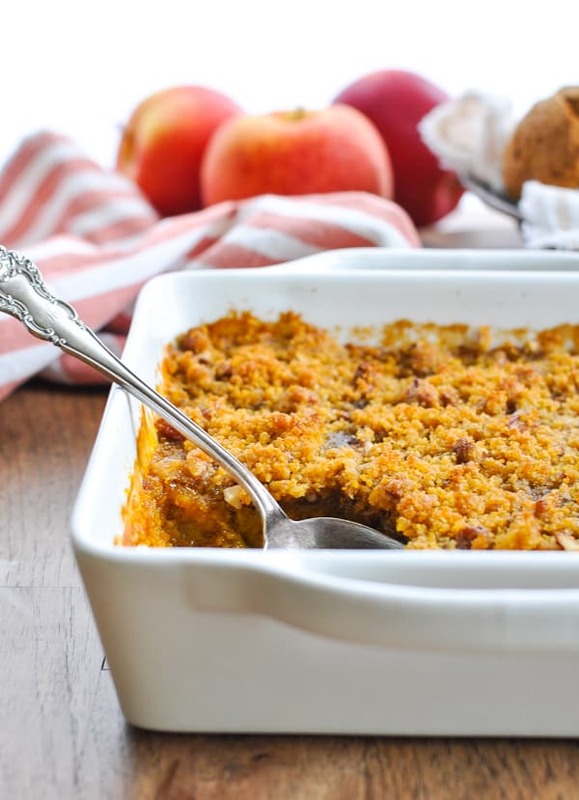 The smooth, creamy sweet potato filling is topped with a brown sugar and pecan crisp, making this “side dish” recipe akin to a dessert! 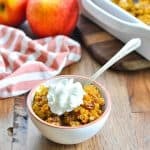 This canned sweet potato casserole takes advantage of a few shortcut ingredients for an easy, quick-prep side. Thanks to canned sweet potatoes and a quick whirl in your blender, you only need about 15 minutes of prep before you can pop it in the oven! You don’t even have to pull out that potato masher! 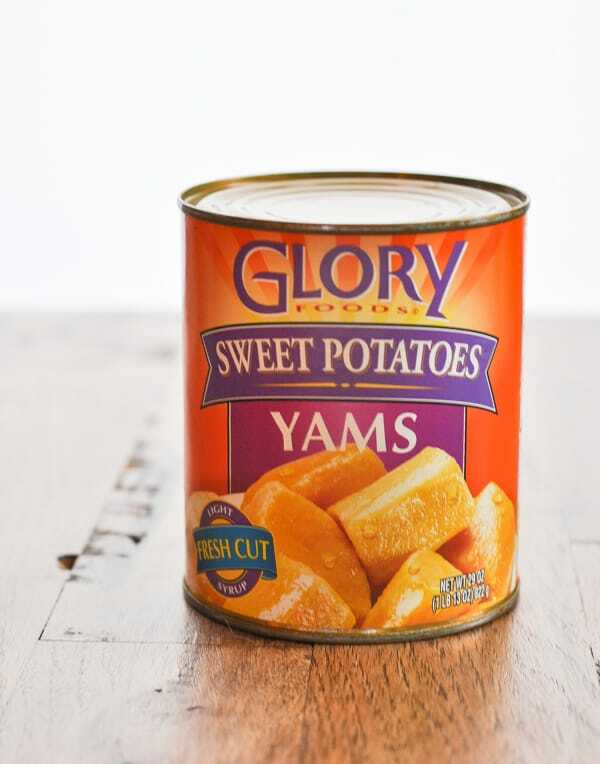 You want to find a large can of sweet potatoes (or yams) in light syrup. Don’t drain the potatoes, though! You’ll heat the potatoes and the syrup in the microwave, transfer the warm potatoes and syrup to a blender, and puree until smooth. Then add eggs, melted butter, sugar, cinnamon, nutmeg and salt to the blender. Give it another spin! 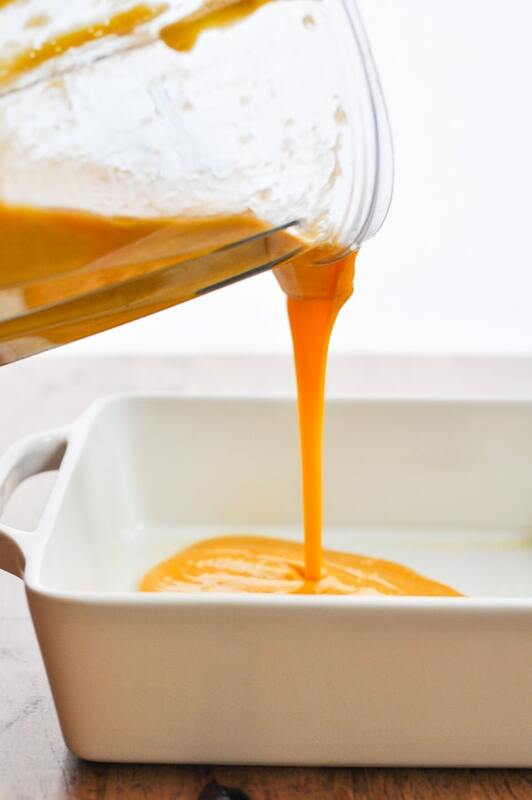 Pour the sweet potato mixture from the blender into a 2-quart baking dish. 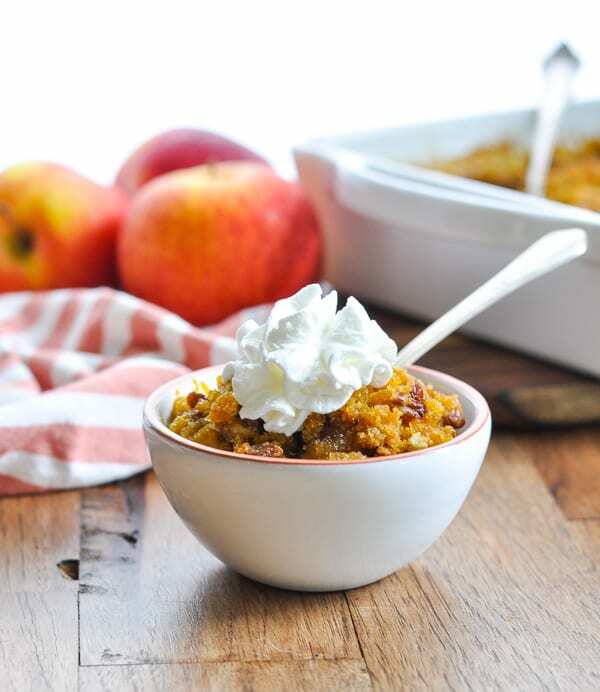 While the easy sweet potato casserole sets in the oven, it’s time to stir together the brown sugar and pecan topping. Oh my goodness…this is definitely the best part! Corn Flakes Crumbs form the base of the topping. 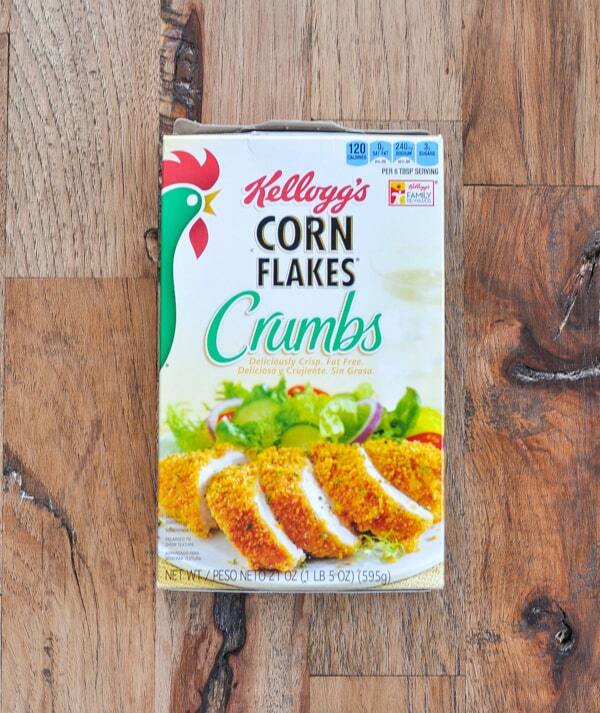 I buy a box of the prepared crumbs to save myself a step, but you can also purchase a box of Corn Flakes cereal and crush them yourself. Those crumbs come in handy in my favorite Baked Eggplant Parmesan recipe, too! 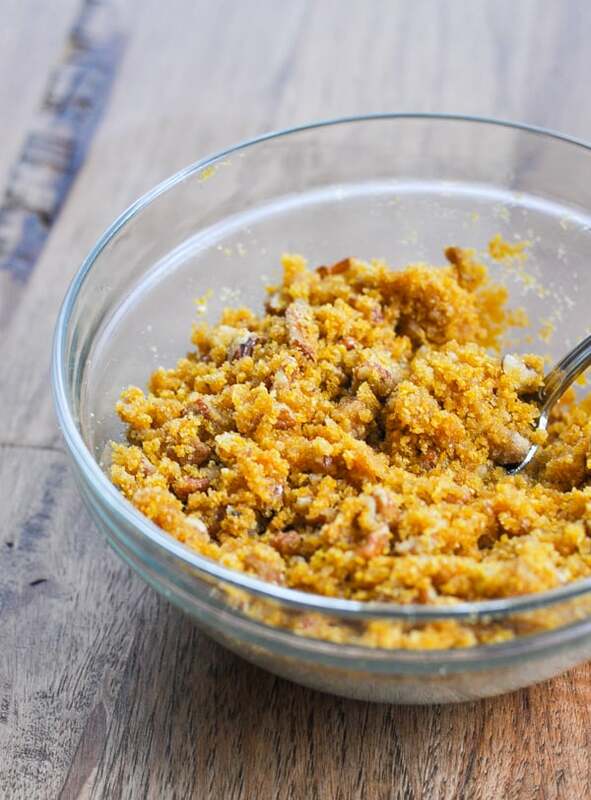 Stir together the Corn Flakes crumbs with more melted butter, brown sugar, chopped pecans, and a pinch of salt. Sprinkle that topping over the casserole, bake for 8-10 more minutes, and you’ll be greeted by this beauty! 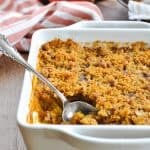 Aunt Bee’s Southern Sweet Potato Casserole with Pecans has been loved by friends and family for decades, and I hope that it will appear on your table this season, too! Do not drain the can of sweet potatoes! You want that syrup to puree with the potatoes in the blender. 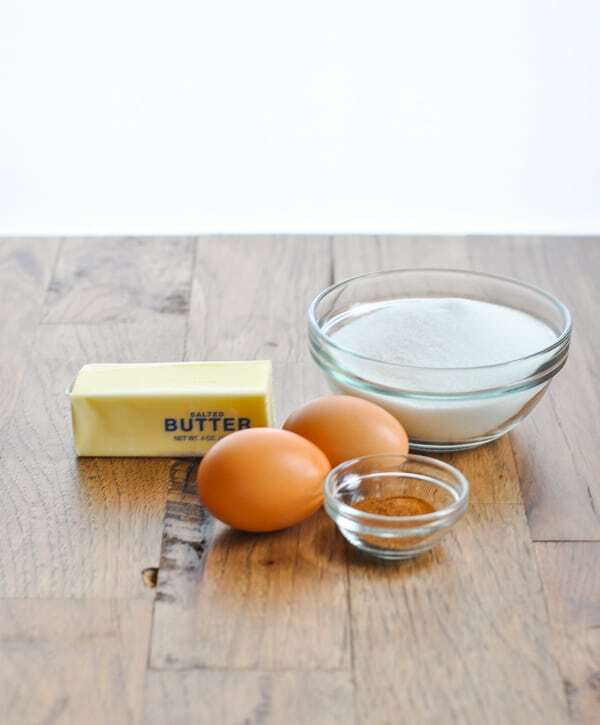 I prefer salted butter in this recipe to counter-balance the sugar. 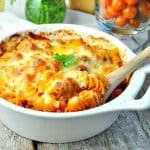 Make sure that the casserole is almost set (not liquid in the center) before you put on the topping. 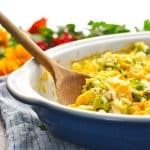 Otherwise, the topping might burn in the oven if you have to leave the casserole in too long. Prep Ahead! I have prepared and baked this entire side dish in advance. Then, to reheat, cover lightly with foil and place in a 350 degree oven until heated through. At this time of year, the last thing that we need is a complicated side dish. Instead, let’s keep it simple with classic recipes that have been loved by real folks for generations! Spray a 2-quart baking dish with cooking spray and set aside. Place potatoes (with the syrup from the can) in a large microwave-safe bowl. 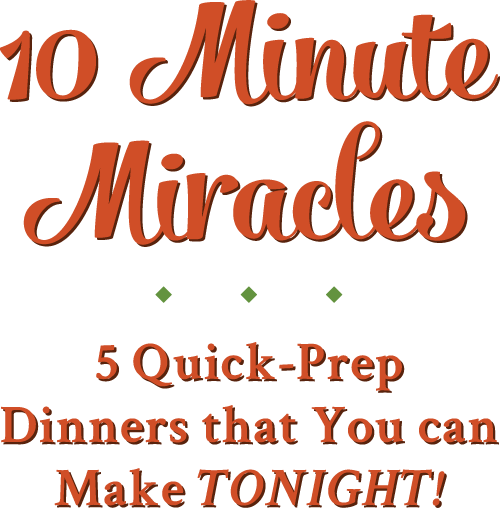 Warm in the microwave for about 30 seconds – 1 minute. 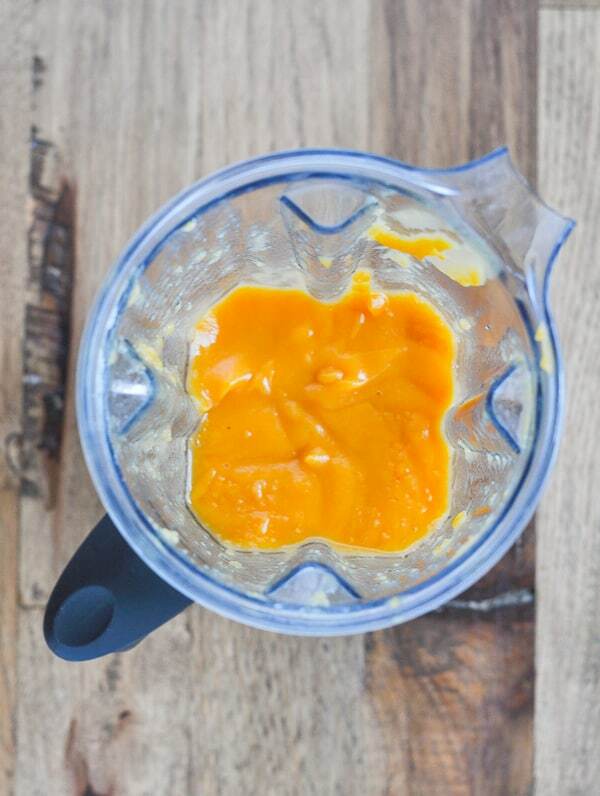 Transfer to a blender or food processor to puree the potatoes until smooth. Add the melted butter, sugar, cinnamon, nutmeg, eggs and salt to the blender and mix well. 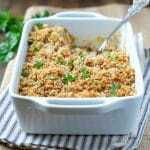 Place potato mixture into prepared baking dish and bake, uncovered, for 20-35 minutes, or until almost set. Meanwhile, in a bowl, combine the topping ingredients. Spread topping onto potatoes and brown for another 8-10 minutes. Allow to rest for at least 10-15 minutes; serve warm. 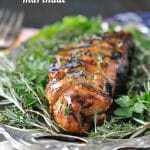 This recipe was originally published in November, 2014. It was updated in October, 2018. 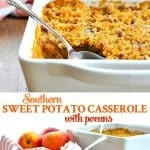 I’m drooling lol… sweet potato casserole is a favorite of mine and that recipe looks amazing! Thanks, Amanda! 🙂 Sweet potato casserole is also one of my favs, and this is BY FAR the best I’ve ever had. Totally mouthwatering! Hah! 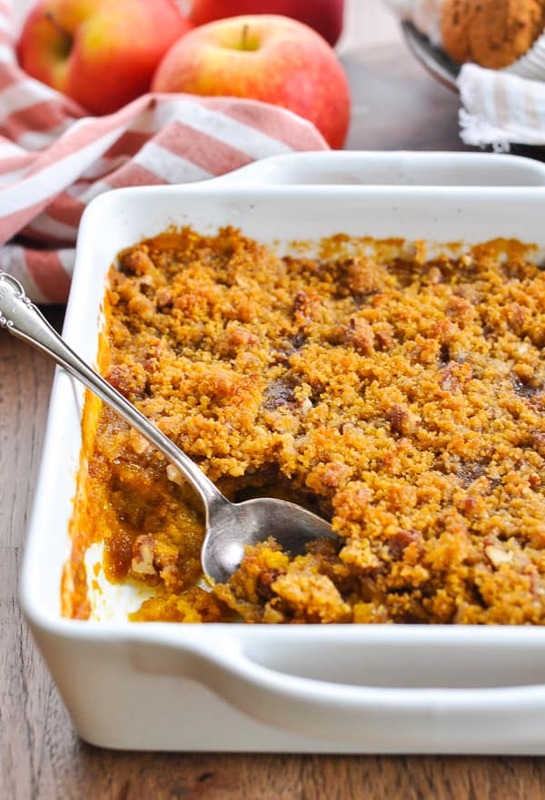 The sweet potato casserole looks so good!! I have to try it. Thanks for the recipe! Family recipes that are passed down are the best! This looks wonderful! I’ll be sharing it on my Facebook page tomorrow! Thanks for joining us at Foodie Fridays…it’s always such a pleasure to have you join us!